May 15, 2018 – Alpharetta, GA – For the third consecutive year, Jackson Physician Search is one of the Best Places to Work in HealthcareTM for 2018, according to Modern Healthcare. The annual program recognizes outstanding employers across the industry. “In building our team and our blueprint for cultural fit, we embrace the core values of the Jackson Healthcare companies: Others First (Put others before self), Wisdom (Do the wise thing) and Growth (Keep getting better),” Stajduhar added. Jackson Physician Search first made the list in 2016 as one of the top 15 Best Places to Work. In 2017, they advanced into the top 10, ranking as ninth with the additional distinction as fourth Best Place to Work for Millennials, in the supplier category. Modern Healthcare released the 2018 alphabetical list on May 14, and will publish the rankings in September at the Best Places to Work in Healthcare Awards Dinner. Jackson Physician Search is 25th on Fortune’s list of best small and medium companies and certified as a great workplace by the independent analysts at Great Place to Work®. Its parent organization, Jackson Healthcare, has been recognized on the Atlanta Business Chronicle’s “Best Places to Work” list since 2005. Jackson Physician Search specializes in permanent recruitment of physicians and advanced practice providers to hospitals, health systems, academic medical centers and medical groups across the United States. The company is recognized for its track record of results built on their clients’ trust in the skills of their team and the transparency of their process and fees. Visit www.JacksonPhysicianSearch.com and Jackson Physician Search on LinkedIn. Follow @JacksonPhysicianSearch on Facebook and @Jackson_Search on Twitter. According to Merriam Webster, the word has nuanced meaning. It can be “a point of view” or “a prospect for the future.” Charging headlong into 2018, you may first think in terms of the future: What can we count on to remain constant next year? What changes do we expect? What will utterly shock us in 2018? The truth is, we can’t predict the future – and only a few of the factors that influence the future outlook are under our control. That’s why our point of view really matters. If we look at our challenges as opportunities – and communicate about them with transparency – we will expand the positive impact of the work we do for our organizations and communities. What Influences Point of View? 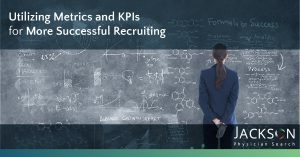 What Influences Recruitment in 2018 (and Beyond)? In 2018, there will be no relief in the pressure to recruit physicians and advanced practice providers, especially in rural, remote and low-income areas. 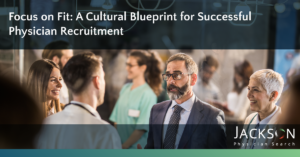 But viewing physician recruitment as an insurmountable challenge can sometimes cloud our vision and cause us to overlook the opportunity to build on our foundation of relationships and exercise transparency, creativity and resourcefulness. Certainly we will be more constrained by limits on compensation and resources. Fortunately, those are not the only criteria that motivate providers to practice in our communities. 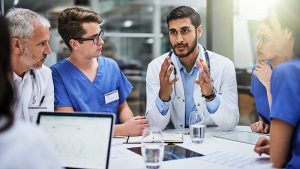 Physicians and advanced practice providers want to become valued members of a community in which teamwork and partnerships extend beyond the clinic exam room and hospital walls. Yes, we need physicians, but they need community partners to help them fulfill their life’s work and use their training to promote health. They respond well to clear expectations, transparency about the realities of a practice, and no hidden agendas. At Jackson Physician Search, it is our job to understand the needs of the hospital or clinic, discover the motivations of candidates, and find the fit that works for everyone from the facility and the community to the physician and his or her family. Communicating and acting with transparency has the power to transform our communities to become the places where the best providers want to work and live. If we can declare 2018 as the Year of Transparency, the outlook for recruiting physicians who will fit, success, and stay will be positive. Learn more about the Jackson Physician Search policy on transparency …or Contact a consultant now to start building a transparent and rewarding relationship. Oct. 4, 2017 – Alpharetta, GA — Jackson Physician Search advanced to the top ten Best Places to Work in Healthcare, as revealed at Modern Healthcare’s annual awards dinner, held September 28th in Las Vegas. This year’s ranking as 9th among suppliers represents the second consecutive year of recognition for the firm, which also again ranked as 4th Best Place to Work for Millennials in the supplier category. Modern Healthcare’s program, now in its 10th year, recognizes outstanding employers across the industry. Jackson Physician Search was certified this year as a great workplace today by the independent analysts at Great Place to Work®. Jackson Physician Search is part of the growing family of Jackson Healthcare companies. Jackson Physician Search specializes in the permanent recruitment of physicians and advanced practice providers to hospitals and health systems across the United States. The company is recognized for its track record of results built on their clients’ trust in the skills of their team and the transparency of their process. As one of the Best Places to Work in Healthcare, Jackson Physician Search attracts and retains the most talented and motivated recruitment professionals in the industry. Peak Vista Community Health Centers, a 26-clinic Federally Qualified Health Center (FQHC), serves over 90,000 patients in Colorado’s Pikes Peak and East Central regions. Keeping the candidate pipeline full had been challenging, especially for their rural and remote communities. 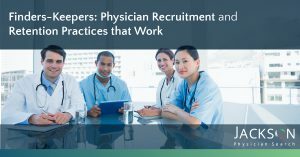 Stiff competition with others offering higher compensation makes it mission-critical to recruit physician candidates who fit and thrive there. 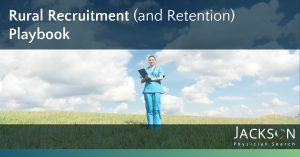 Please review our case study detailing the physician recruiting success we achieved for Peak Vista Community Health Centers’ rural and remote facilities. Peak Vista Community Health Centers serves over 90,00 patients in Colorado’s Pikes Peak and East Central Regions. They were having difficulty recruiting physicians, especially for the more rural and remote areas. 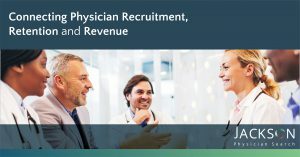 Partnering with Jackson Physician Search gave Peak Vista a proven recruitment process and the expertise of recruiters who completely understand candidate motivations. Quick placement of physicians, including rural clinics with populations of less than 2,500. Thanks to our unprecedented success recruiting physicians, Peak Vista now exclusively works with Jackson Physician Search. Learn more about how we can help you fill your vacant positions here. Jackson Physician Search: New Name. Winning Culture. ATLANTA (PRWEB) – Jackson Physician Search announced its ranking as one of the top 15 Best Places to Work in Healthcare, as revealed at Modern Healthcare’s annual awards dinner, held October 6th in New Orleans. Company representatives marked the occasion as a double celebration of being a first-time honoree and a fitting debut for their new name and brand identity. The company, formerly known as Jackson & Coker Permanent Placement, introduced their new name and logo in September to highlight their leadership and to clarify their role in the permanent physician placement industry. 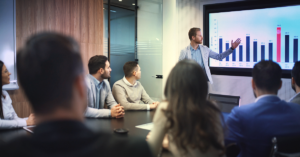 They credit the company’s growth to their outstanding track record of results, built on the trust their clients place in their skilled team and the transparency of their recruitment process. Jackson Physician Search placed 14th overall in the Best Places to Work contest and 11th in the supplier category. These rankings validate their strategy of empowering their employees to provide clients and candidates with the best possible services and customer experience. Investing in innovation and future growth is also a priority for Jackson Physician Search. This was reflected in the company’s 4th place rank for having the most engaged and most satisfied group of millennials on staff. The rank was based on the percentage of millennials in the company’s workforce and the number of employee satisfaction surveys completed by millennials. Jackson Physician Search is part of the growing family of Jackson Healthcare companies. Jackson Healthcare has been named Atlanta’s Best Place to Work for three consecutive years by Atlanta Business Chronicle.